If you google the best coffee in Vienna, you’ll be greeted by a long list of the opulently appointed old guard of Vienna’s cafe scene, a list that stretches from the centrally located Cafe Demel on Kohlmarkt to Cafe Sperl in Vienna’s 2nd district over on Gumpendorfer Strasse. All bearing wonderfully filled glass cabinets of cakes, marble counter tops and an air of high society, only slightly clouded by the number of excited tourists indulging in their wares. This would have you believing that the Viennese coffee scene is all about enjoying dark roasts buried in milk and sugar, alongside a slice of sacher torte. 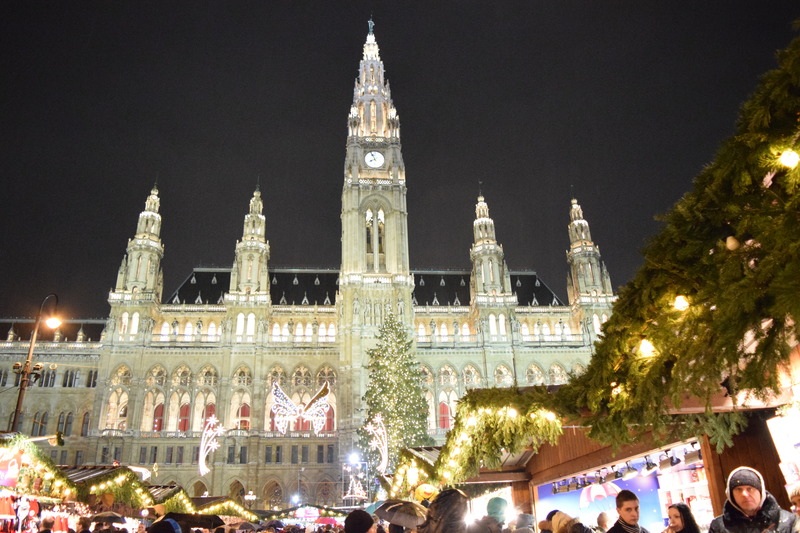 But Vienna is a modern, cosmopolitan and avant guarde city, I hear you say, it’s arty, fashionable, architecturally beautiful and even its public transport is efficient. 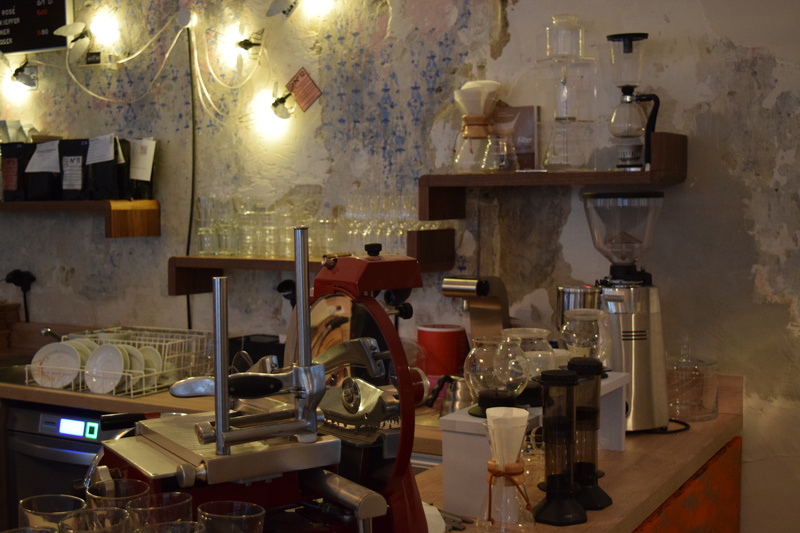 Leaving you questioning, where is Vienna’s progressive third wave coffee scene? As it turns out, it’s mainly tucked away in the side streets just outside the outer ring, sporadically littered between Karlsplatz and the University. 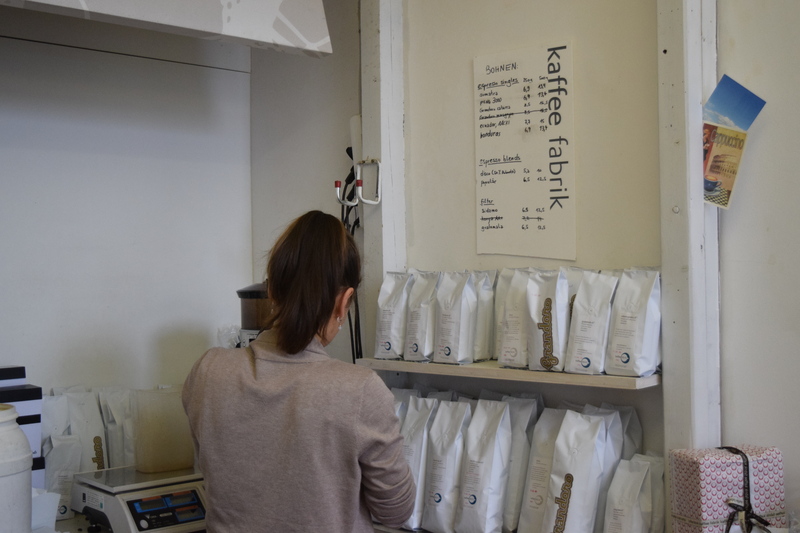 Whatever Vienna’s specialty coffee scene lacks in social media presence, it certainly doesn’t lack in quantity or quality. 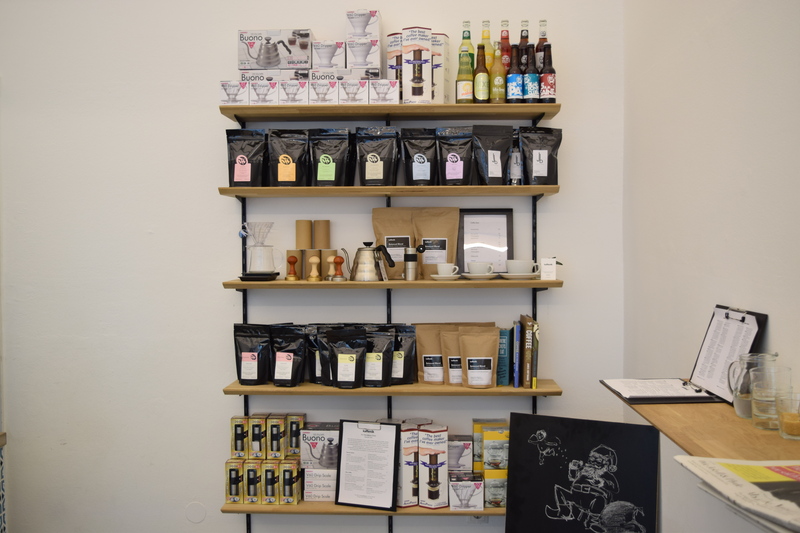 Having visited 7 coffee shops across Vienna I’m still not convinced that I’ve accurately covered the size of Vienna’s burgeoning specialty coffee scene. 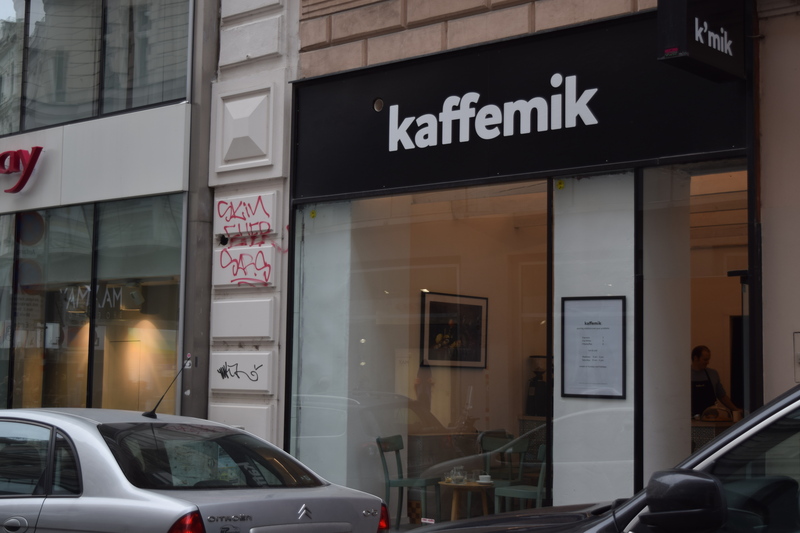 Just off Mariahilfer Strasse on the slightly quieter Zollergasse, Kaffeemik is a bright and effortlessly serene escape from the surrounding hustle and bustle of the adjacent high street. 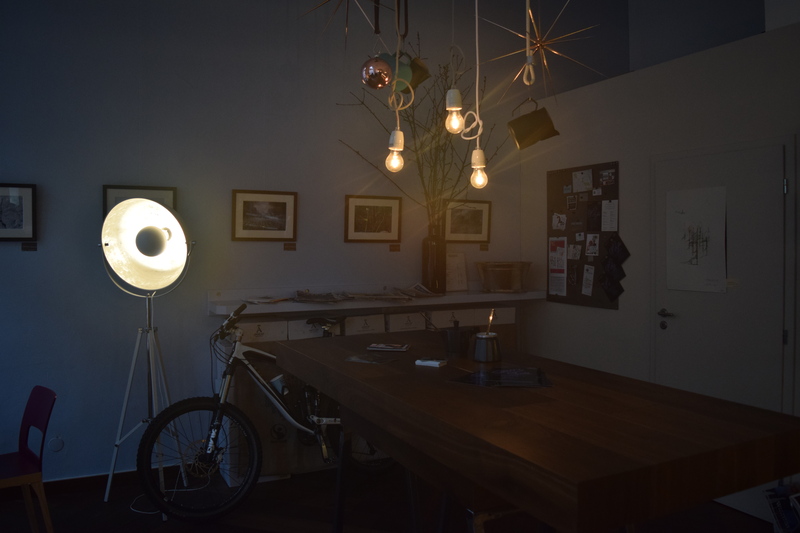 With only couple of tables and a few seats by the window on quieter days, you can almost have this coffeeshop to yourself. 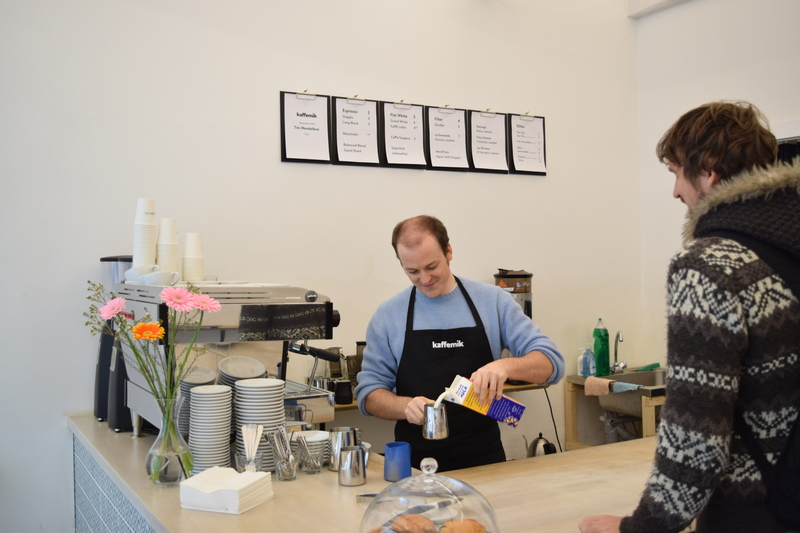 Rotating their coffee every week or so and having featured the likes of Berlin’s The Barn and Copenhagen’s Coffee Collective, we were lucky enough to have arrived on Tim Wendelboe week. Having enjoyed the Finca Tamana from Origin Coffee Roasters last year and having tried the Finca Tamana from Workshop Coffee a few days before at the screening of ‘A Film About Coffee‘ in Leeds, I was eager to taste Tim’s version of the Finca Tamana after all of the improvements being made at the farm over the last year. 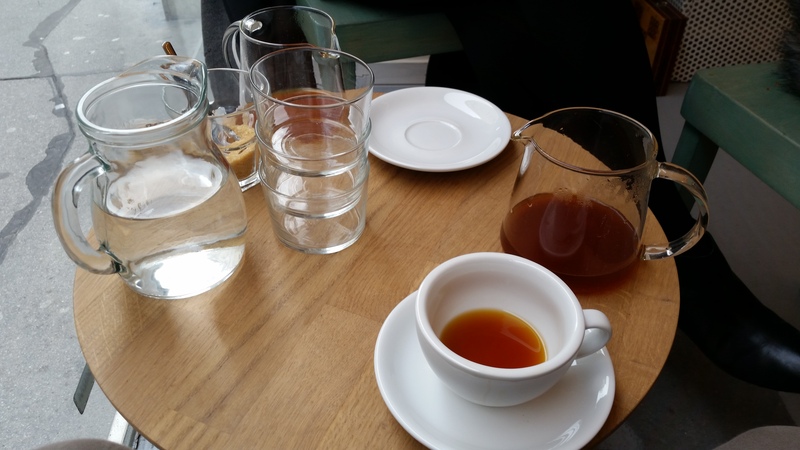 With a wealth of brewing options in front of me, I opted for the V60 brew method before the barista lightly directed me – he had had it on good authority that the aeropress was the preferred method in this particular case, believing that Mr Wendelboe himself preferred the aeropress method for Finca Tamana. Never one to argue with my barista, we sat and relaxed as he meticulously prepared the coffees. On arrival the Finca Tamana was all golden amber, the translucent colour of nectar and in the cup it was no less enticing. Giving off aromas of golden honey, light acorns and some hints of citrus peel it shone in the natural light beside the window. It tasted much like its appearance, clear, clean and sweet like a honey tea with a lengthy acidity hinting at lemon drops and flame raisins. This coffee has hard work and careful cultivation written all over it, it’s a pleasure to drink, as you wallow in its sweet honey finish. 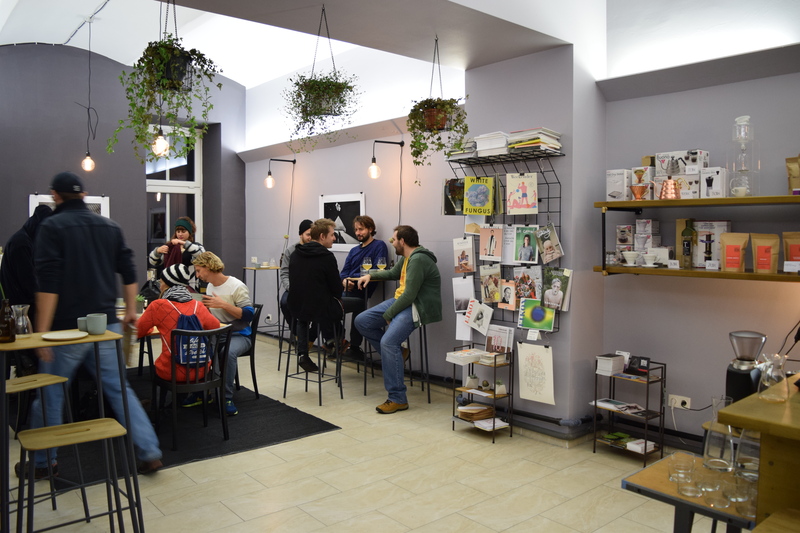 After awaking from my coffee reverie, we talked with the barista about Vienna’s recent screening of ‘A Film About Coffee’ the week previous and how it had been a great chance for Vienna’s specialty coffee scene to get together in one place. A scene we were going to get to know better over the coming days. 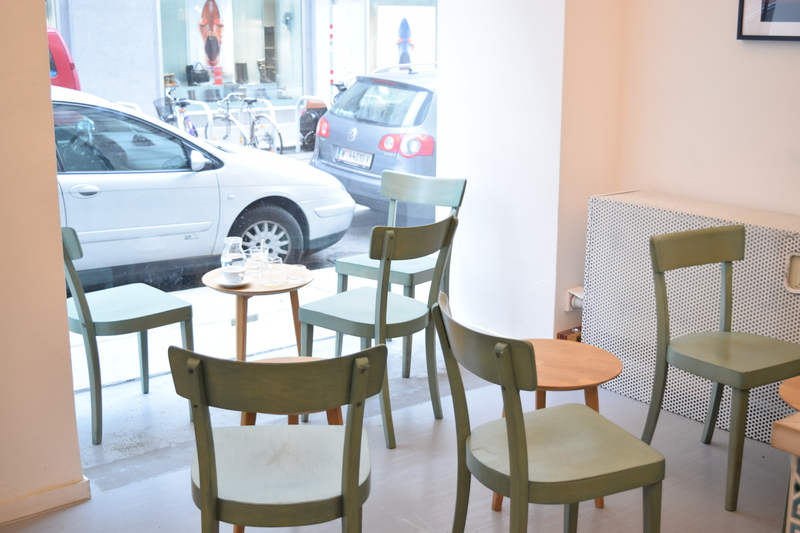 P.O.C has been running for a few years now and has built up its reputation as one of Vienna’s most progressive and westerly leaning coffee houses. Particularly notorious for it’s western style milk work on its lattes and cappucinos, I’m confident they would be winning any local Viennese latte art throwdown competitions. In contrast to Kaffeemik we arrived to a full house, with little room in its cosy close quarters. 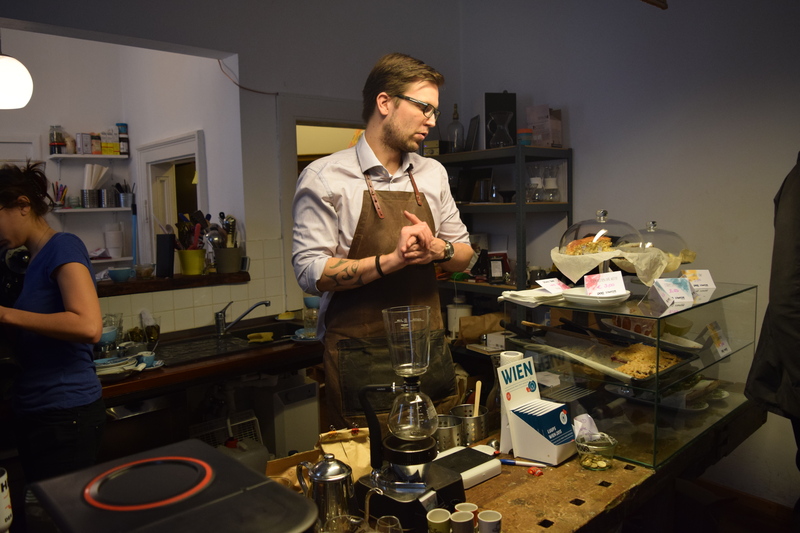 Fortunately this is a friendly and chatty kind of a coffee shop with the barista almost doubling up as a comedian, giving the place the feel of a party rather than an uncomfortable crowd. 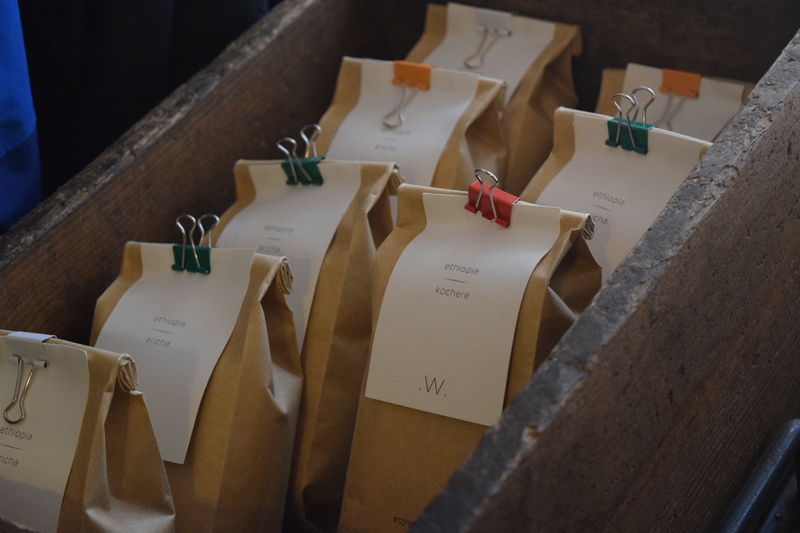 The barista took us through our options whilst cracking the odd quip en route, helping me to select a natural processed Ethiopian Kochere heirloom from White Label Coffee. We hopped on the end of one of the full tables and soaked in the atmosphere whilst waiting for what our barista described as slow coffee, so slow he added that tourists had to factor in an additional day just to visit P.O.C. Thankfully none of the humour was lost in translation and the coffee arrived within minutes rather than hours. Arriving with the usual Kochere aromas of red and black berries clinging to the traditional Ethiopian floral tones with hints of caramels and chocolate. Noticeably balanced between its roast, acidity and sweetness the coffee gives way to dark berry flavours, tasting a little like the crust of a blackberry fruit cake with a glossy velvet mouthfeel this coffee felt like an indulgent dessert, that I should for some reason feel guilty for drinking. 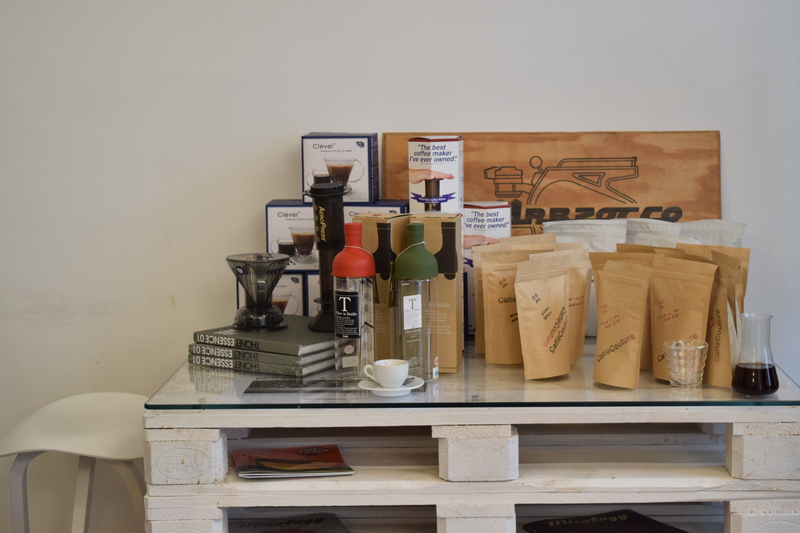 On the way out, we checked over their stand of coffee paraphernalia, featuring copies of Coffee Obsession and the recently released World Atlas of Coffee for public reading, alongside bags of the White Label Coffee we had just enjoyed. 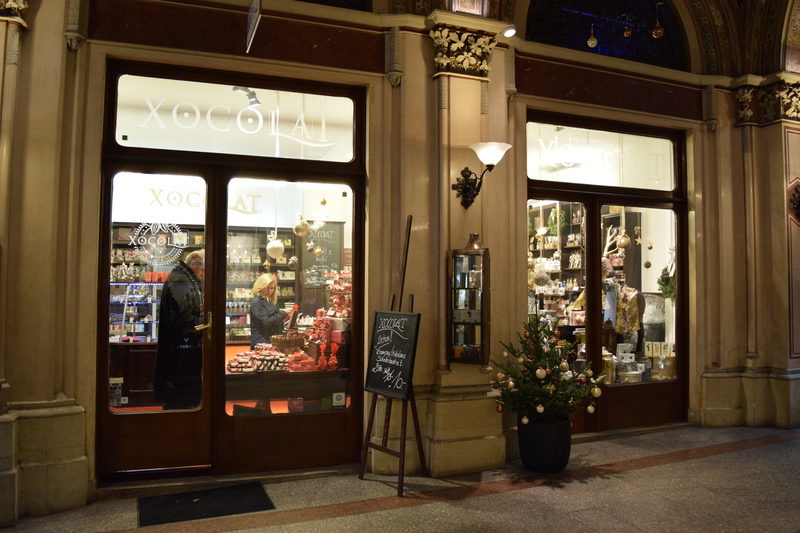 Just off Freyung is a stylish and quaintly aesthetic arcade, which is host to Vienna’s most prestigious chocolate shop Xocolat. On entering you find yourself surrounded by chocolate on all sides, in front are the counters full of individual chocolates, serving anything from chocolate ganaches to jasmin tea truffles. 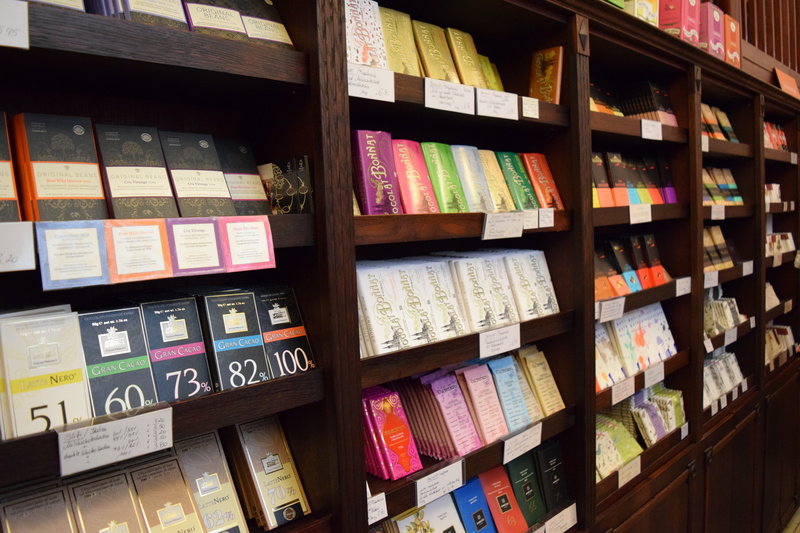 What excited me most about this store however, is the shelved room downstairs, a veritable treasure trove of high quality chocolate bars. 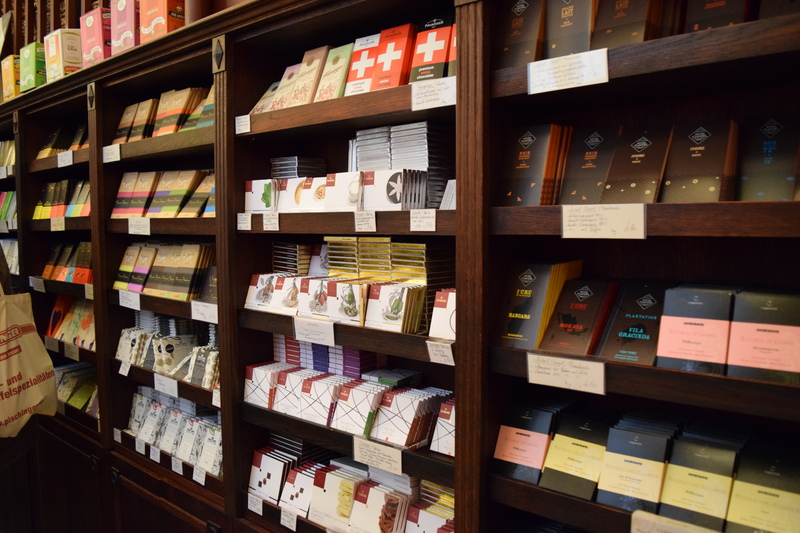 The shelves are stacked with some of the world’s finest chocolate bar manufacturers from the likes of Amedei, Domori, Pralus, Chocolat Bonnat, Michel Cluizel, Rozsavoglyi Csokolade, Original Beans, Madecasse and Austrian chocolatiers Zotter. Unfortunately I didn’t have the luggage space nor the bank balance to go wild in here, as jealous as I was, of the man who had selected so many chocolate bars that he required a basket to carry them all. Instead I window shopped with admiration and curiosity at all the fine craftsmanship on display before sadly taking my leave of such a fine collection. While Caffe Coutures little sister cafe is actually right next door to Xocolat beckoning passers by through its large windowed front, I remained true to my intentions and headed over to the original. On arrival I was certainly glad of my choice, the original Caffe Couture isn’t just a coffee shop it’s a roasting lab too, when it’s not doubling up as an artsy hangout space. 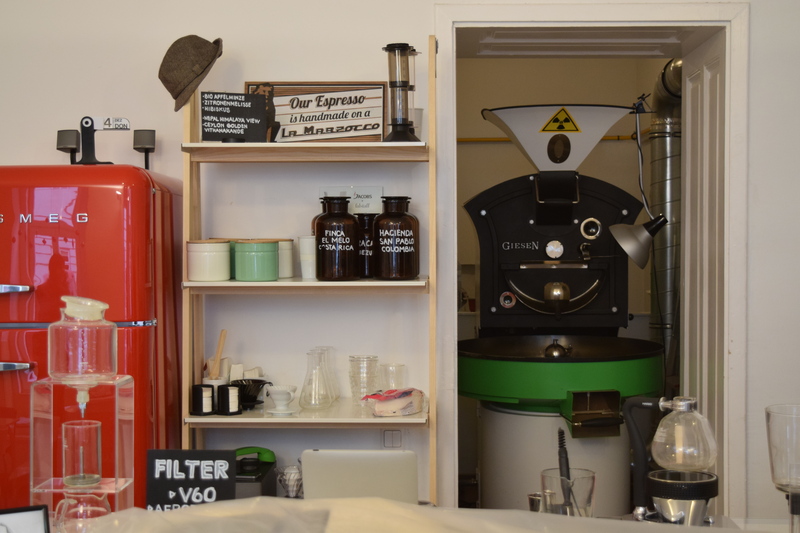 Walking through the doors your eyes are drawn in every direction from the bold Smeg milk fridge to the Giesen roaster peeking out of the backroom. Walking past a freshly delivered crate of green coffee beans, we approached the counter and ordered some brewed coffees. Even though there was only one barista on and it was lunch time, she was more than happy to make up some V60’s for us. We ordered a Costa Rican caturra varietal from Finca El Melo and a Colombian from Hacienda San Pablo. The place was quite busy, but Caffe Couture offers a wide range of standing and seating options, of which we took the available window seats. The Finca El Melo arrived looking like black amber or a translucent black tea with aromas of dark forests swirling round pear and walnut tarts. In the cup it begins as a dark roast reminiscent of almond biscotti, developing a short punchy acidity of white fruit, pears, melon, grape before a sweet marzipan finish accompanied by a light fizzyness in the mouthfeel like an effervescent tea. In Contrast the Hacienda San Pablo was sweet with a bright red apple acidity. 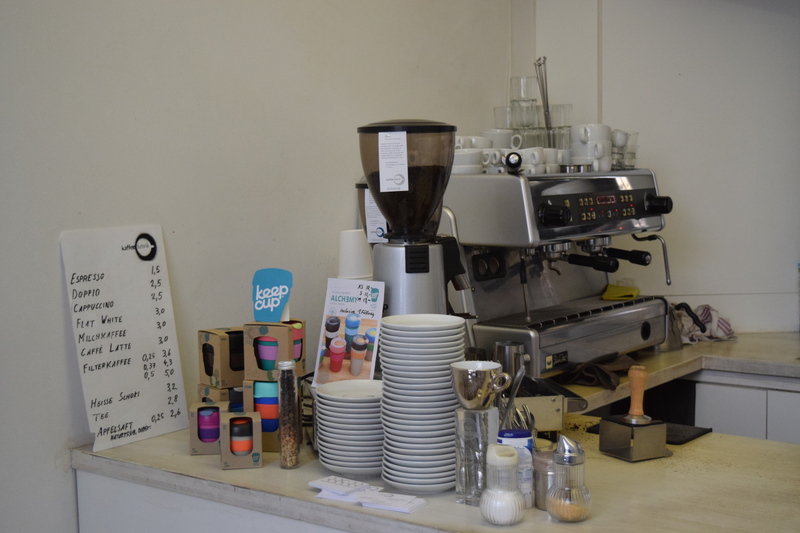 After returning the glassware we chatted to the barista about how much we had liked the coffees and about her favourite coffee shops in London from when she had visited. Her favourite, had not so surprisingly been Prufrock and there were some subtle hints to this across their two branches. 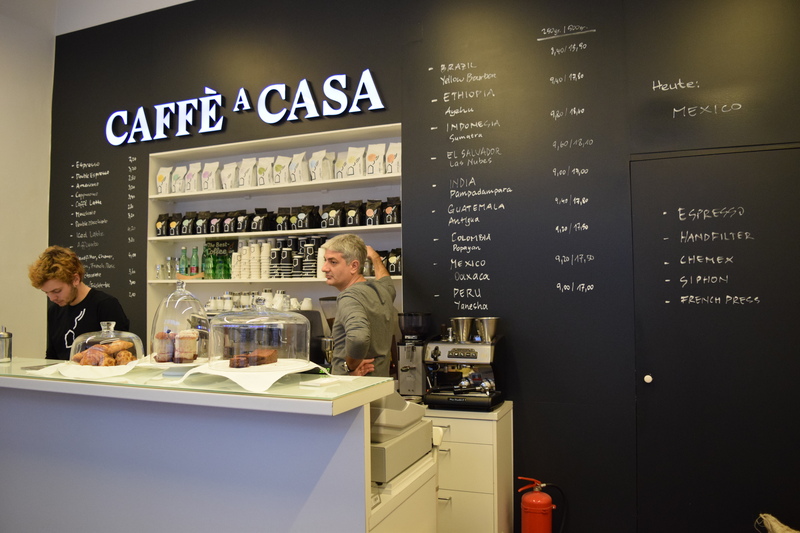 Having recently upgraded its brew range, Caffe a Casa is attempting to adapt to the desire of its customers for a better cup of coffee, by introducing both the chemex and the V60 brew methods. Brew methods aside, I suspect the coffee has always been good here, by the fact that they roast their own and by the lengthy list of origins on the back board from which to choose from. 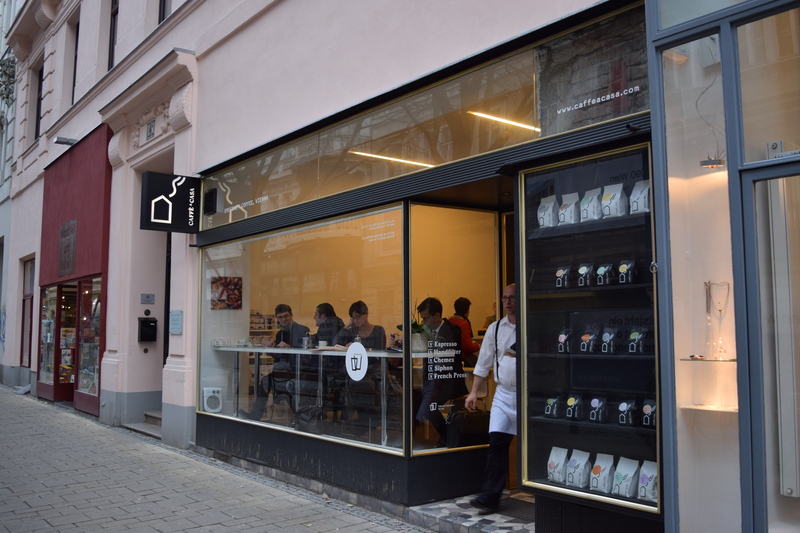 This is a coffee shop that bridges the gap between the Viennese preferences for dark roasts and specialty brew methods. Chatting to the barista, his favourite coffee changed everyday, a bit like mine, but it was clear that a few of the options were a bit dark for putting through a chemex. In the end I settled on a cup from El Salvador a bourbon varietal from Finca Las Nubes. In the cup it was a deep clean black full bodied coffee with rich wood aromas and elements of charcoal and demerara sugar. To taste It was digestive biscuits and hazelnuts with a subtle white grape acidity, over time developing rounder and sweeter notes of caramel shortcake. A nice smooth soft and clean dark roast. Having enjoyed our visit we headed out to cross the Danube. 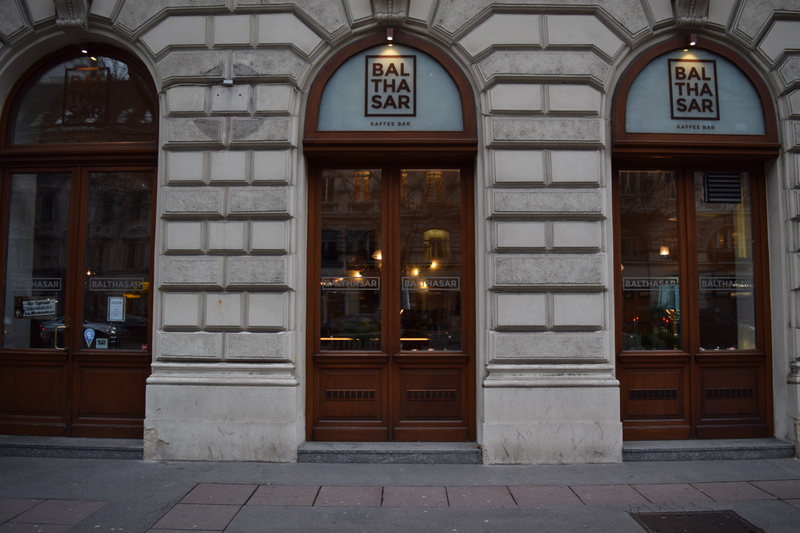 Across the water and in the direction of the Prater lies Cafe Balthasar, the most north easterly of Vienna’s cafes. Discreet from the outside, it is a contrast of wonderful appointments on the inside from hanging lights to gold puffy lampshades and the artfully exposed brickwork on the back wall. 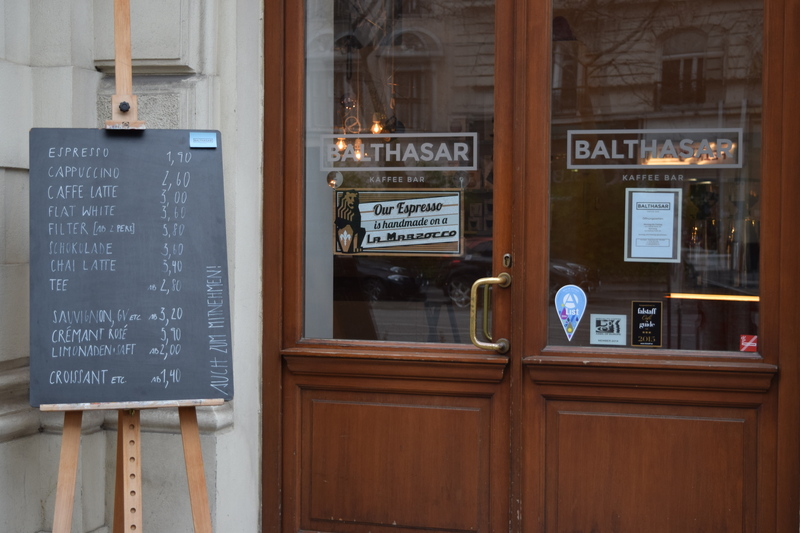 Cafe Balthasar is open and spacious with lots of seating and a large standing area, while managing at the same time to remain warm and cosy. 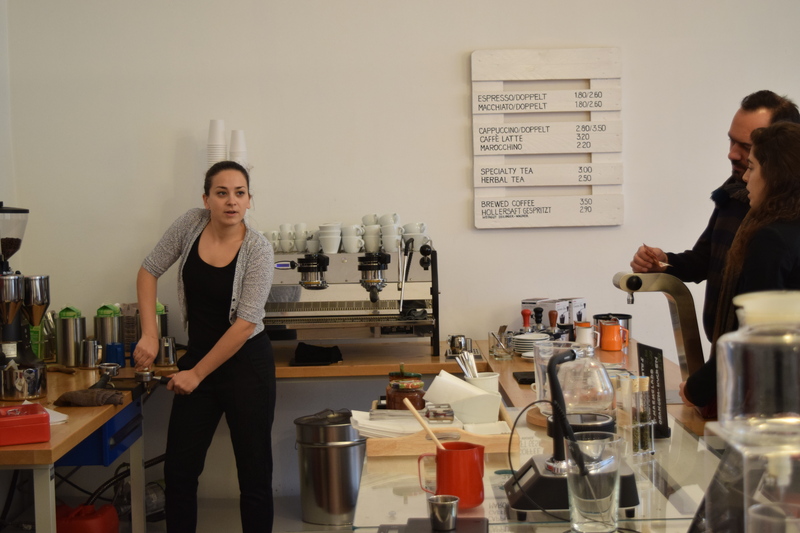 On top of being aesthetically pleasing, Cafe Balthasar also serves up some great coffee. 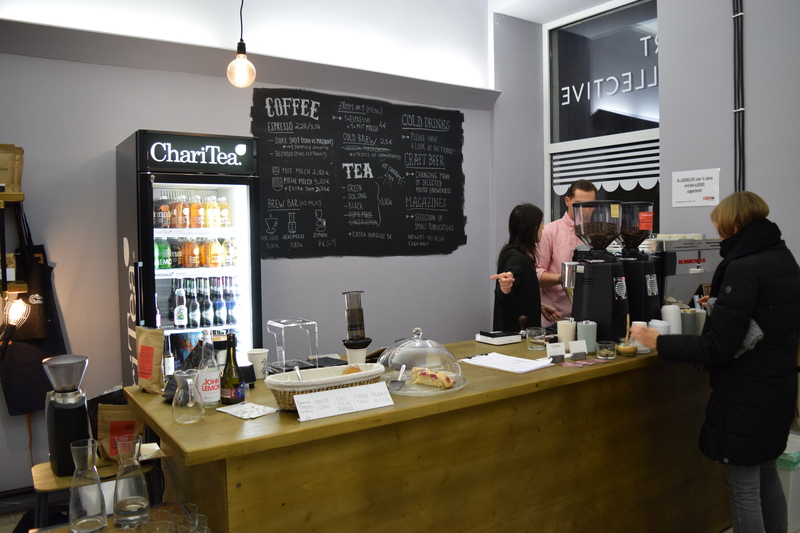 The filter is for two to share, so you’ll need to bring a friend along to this cafe, or a large appetite for coffee if your preference is for brewed, rather than espresso coffee. 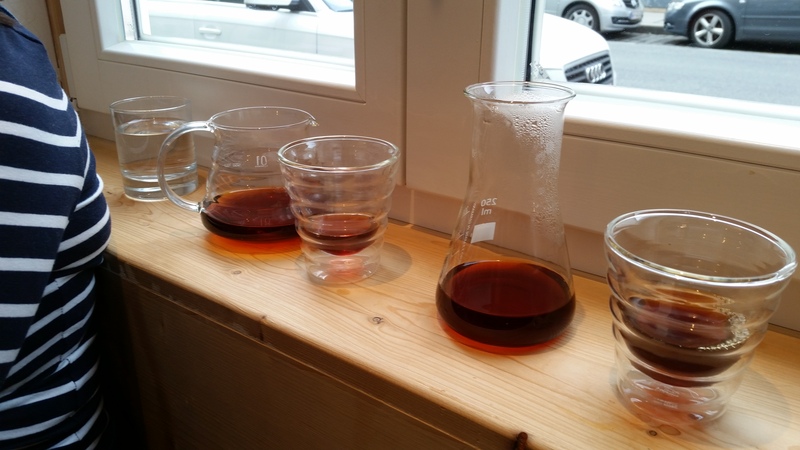 The filter that day was from Johannes Bayer, a mixture of washed SL28 and SL34 peaberry from Muranga Kenya. Arriving looking like heavy but translucent dark amber, it gave off red berry aromas with hints of assam tea and some herbals. To taste It had a slow building bright acidity of tart raspberries and red apples over time developing into blood orange with a sugary honey sweetness. In the mouth it was big, clean and juicy, a bit like cafe Balthasar (they sell glass bottles of pressed juice). This unassuming little coffee shop has long been respected by the locals for great coffee, at least 3 people walked in just to buy bags of beans whilst we were there. A largely white vertically climbing interior gives the place an open, fresh and light feel. Approaching the counter we interrupted the barista filling baking cases with her freshly made cake mix, we had turned up a fraction too early to enjoy cakes straight out of the oven. Checking out the coffee menu I opted for the washed Ethiopian Sidamo, curious to see how a delicate Ethiopian might come out in a darker roast. Our barista set up the V60s and began measuring out and grinding the beans. 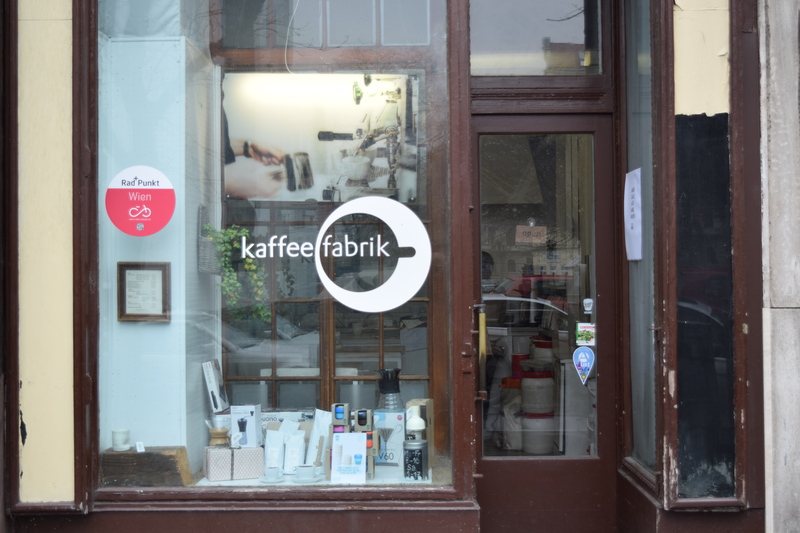 We took a couple of stools in the middle of the room and leafed through their copy of Vienna’s coffee guide, spotting favourable mentions for Caffe Couture, P.O.C and of course Kaffe Fabrik itself. Having finished flicking through its pages the coffee arrived. A deep dark full bodied coffee with dark wood and chocolate aromas dominating the subtle citrus and jasmin floral notes. To taste this was a punchy bright coffee trying to break through the dark roast. 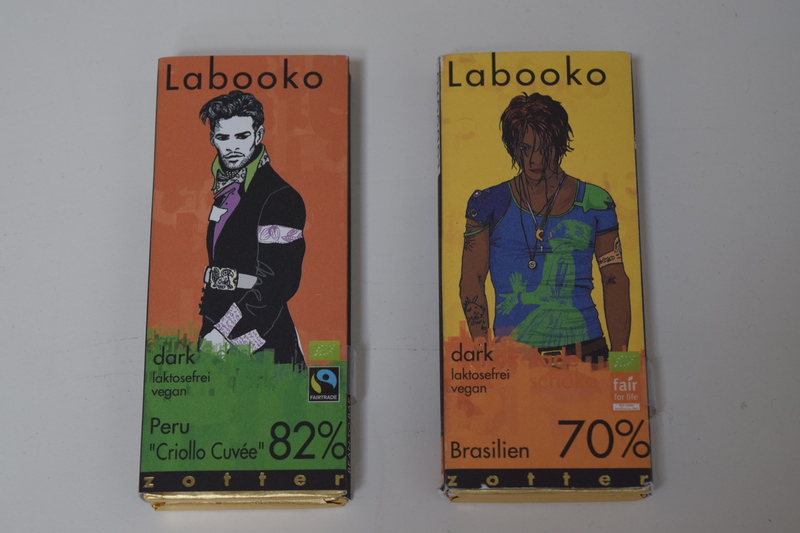 Lemons, pears and passionfruit all creeping through 90% chocolate. Rounded by underlying grapefruit acidity and a frangipane sweetness, the coffee was big and smooth with a creamy mouthfeel. After coffee we chatted with the barista, about our mutual love of chocolate and a special tub of Italian hot chocolate she had bought her parents for Christmas. Discussing the merits of our day ahead perusing art galleries and drinking yet more coffee. 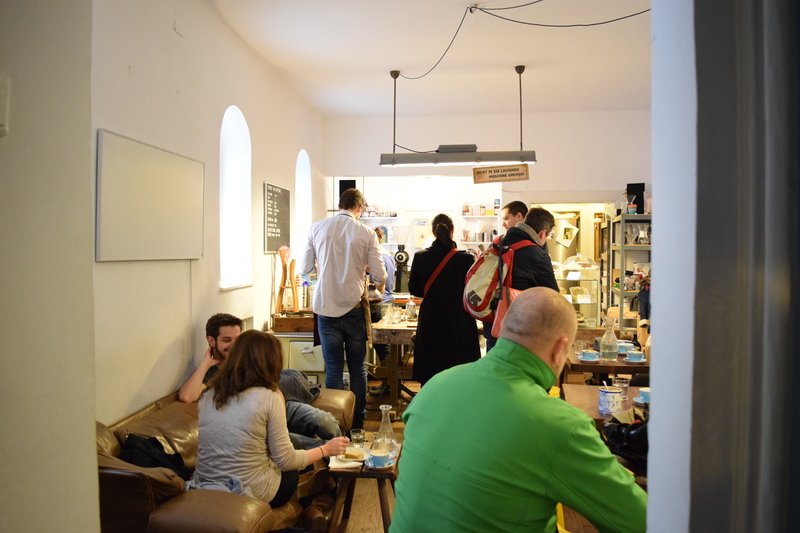 Close to the Museums Quartier, Zamm Coffee and Art Collective is clearly the most hipster of Vienna’s coffee scene. Everything in here is cool, the till is an ipad, there’s Caffeine Mags all over the communal table and there’s art&photography on every wall. 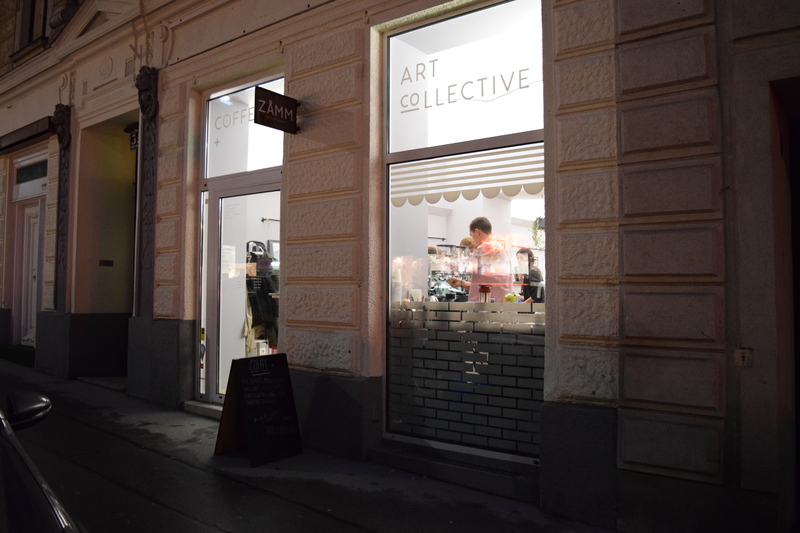 After all this is a coffee AND art collective. Running a little short on time, unfortunately we had to skip the very appealing siphon brew method in favour of the slightly quicker V60 option. Enquiring as to what filters were on, the barista took me through the 2 available options, quietly mentioning that he might have some geisha available from his own private stash. Immediately forgetting everything he had said before the word geisha, I took him up on his kind offer to let me have the last of his personal bag of Tim Wendelboe’s Hacienda Esmeralda. A previous favourite of mine when I’ve had it from Grumpy Mule, it’s little surprise that it has won plenty of awards. I was excited to see how this coffee had turned out under Mr Wendelboe’s supervision. 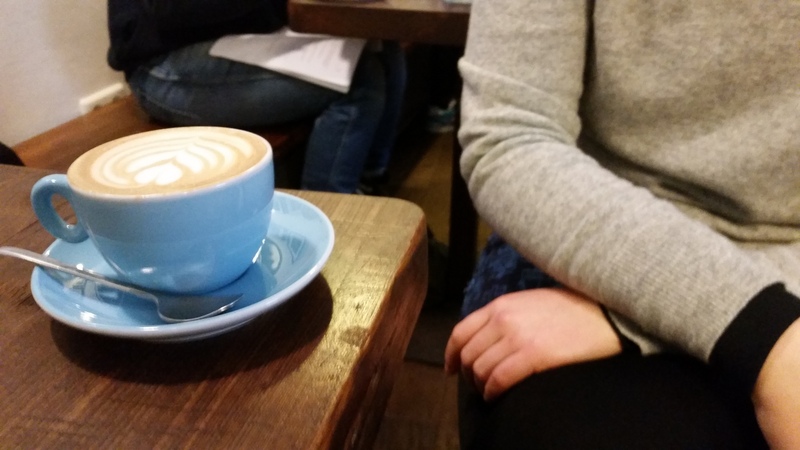 Whilst waiting for the coffee, we leafed through a few of Caffeine Mag’s back issues, which were in pristine condition and browsed a few articles on the best milk for milk work as well as chocolate and coffee pairing. Interupted mid article the coffee arrived as a medium bodied redenned brown liquid, delightfully floral with rich woodsmoke and single origin chocolate notes. To taste it had a rich fruity acidity of mixed citrus and a light caramel sweetness with some hints of christmas cake and spice. A smooth velvety mouthfeel accentuates how rich and transparent this coffee is, allowing all the flavours to be clean and distinct. Having little time to catch the Leopold Museum before closing, we settled up at the counter, expressing our grattitude before making a dash for it. Unfortunately we didn’t have time to visit the likes of Kaffe Modul, Akrap Coffee, Coffee Pirates or the Vienna School of Coffee, but I was lucky enough to pick up these. 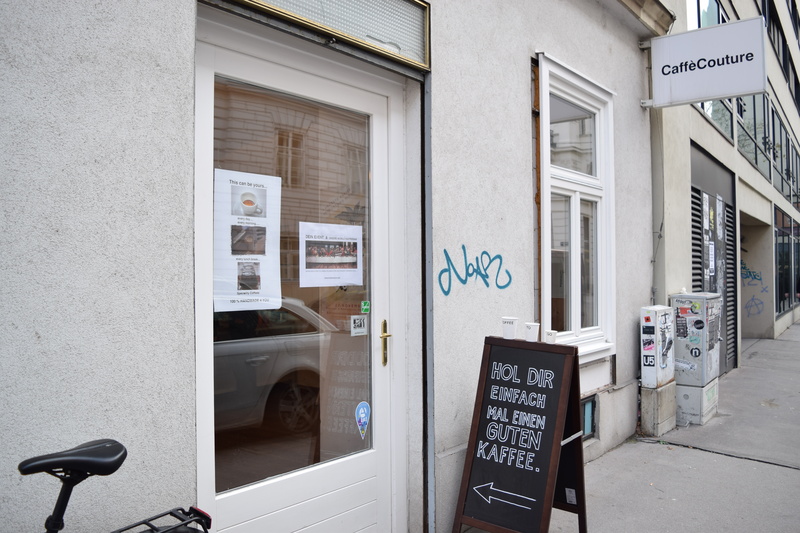 This entry was posted in chocolate, coffee, Uncategorized, Vienna, Wien and tagged Cafe Balthasar, Caffe a Casa, Caffe Couture, chocolate, Coffee, kaffe Fabrik, Kaffemik, People on Caffeine, Tim Wendelboe, Vienna, Wien, xocolat, Zamm Coffee and Art Collective, Zotter by commoditiesconnoisseur. Bookmark the permalink.